Italian Classics specialist Alessandro Ballan provided one of the biggest surprises of this year’s Tour of Spain with a fine lone stage win in the Pyrenees. On paper stage seven, a hideously long trek through the Pyrenees culminating in a double ascent of La Rabassa in Andorra, was a day made for the climbers. But Ballan?s infiltration of a five-man break in the first hour?s racing gave the Flanders 2007 winner – rarely seen on the front in the mountain stages – the edge on the favourites. The atrocious weather – heavy rain, temperatures 20 degrees colder than on stage six, and dense fog, did not encourage a fast reaction from the favourites behind. By the time Cofidis and Astana started to wind things up on the 223.2 kilometre stage in the main bunch, the quintet – none of them favourites for victory in Madrid – were still a good 10 minutes ahead. Come the final ascent of La Rabassa – 16.4 kilometres long – Ballan attacked at the foot of the climb. With an advantage of over five minutes, and just two and a half minutes behind race leader Sylvain Chavanel (Cofidis) overall, a stage win and a spell in the maillot de oro were both real possibilities. Ballan finally emerged from the mist at the summit of La Rabassa with an advantage of nearly three minutes over a group of favourites which had shrunk to a bare half dozen. As a result, Ballan clinched both the stage win and a minute?s lead on American Levi Leipheimer overall -all thanks to taking the plunge early on and going all out in a break nearly 200 kilometres long. It?s highly unlikely that the Italian will be in the lead after Sunday?s second mountainous stage, but it was a superb performance nonetheless. And as for the favourites? The main bunch had shrunk to 45 riders the first time over the Rabassa, but the appalling weather and a climb with few really steep sections meant the options for attacking were limited. 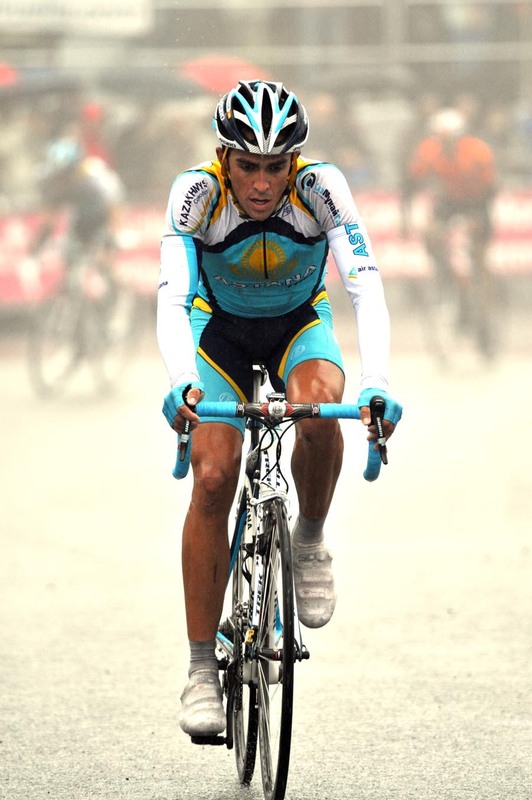 The second time on the Rabassa Alberto Contador (Astana) did put in an acceleration in the final kilometre that took him to third place, 2-42 down on Ballan and just three seconds slower than second-placed Ezequiel Mosqueras (Xacobeo-Galicia). Contador?s late charge sent Alejandro Valverde (Caisse D?Epargne) sliding backwards, losing nearly a minute by the summit. Previous race leader Sylvain Chavanel also suffered, finishing in 15th place, 3-21 down on Ballan. But both Levi Leipheimer (Astana) and Carlos Sastre (CSC-Saxo Bank) were only a few seconds behind Contador. Overall, Contador has leapfrogged ahead of Valverde, who slides down to fifth. But there?s still only 1-27 between Leipheimer, in second place, and Sastre in sixth. In other words, after one long time trial and one very tough mountain stage, all of the favourites are still in with a chance of overall victory in Madrid. So far, the Vuelta 2008 has been seven days of intriguing stalemate. 10. Davide Rebellin (Ita) Gerolsteiner at same time.